Having said that, our home base for the weekend, the Villa Italia was perfectly lovely. Our room was furnished in a modern European style, with a clean design and comfortable bed. 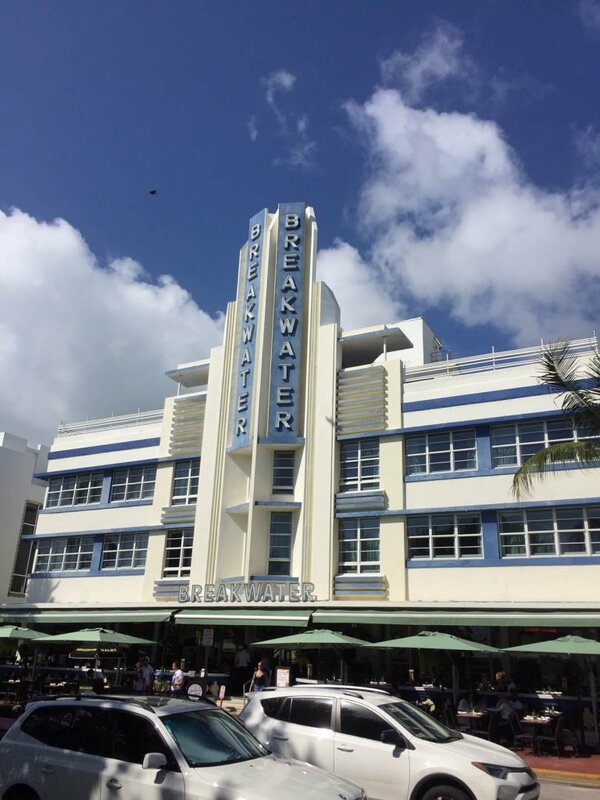 Just as important, it was in an ideal location, walking distance from South Beach, restaurants, stores, and an incredible Italian bakery. Whether in the daytime or evening, South Beach is a great area to walk around. Strolling the beach offers a laid back respite to driving anywhere in Miami. And visually, South Beach is lush and interesting. The beach itself is beautiful and expansive, if packed with people. We also enjoyed strolling through Lummus Park which borders the beach. Bikers, roller bladers, joggers, and leisurely walkers all coexist well along the paths through the park. There are also plenty of shaded areas to plop down for a break and to take in the scene. After strolling through the park we took our time appreciating the many cool hotels and other buildings in South Beach. There are many famously constructed in an Art Deco style. We loved the individuality and personality of each building. Food, glorious food: our weekend in Miami did not disappoint in this regard. Our first evening in Miami we had a late night meal at the French bistro Otentic on Washington Avenue. We ate light with soups (french onion and a lobster bisque), appetizers (including an incredible red tuna tartar), dessert, and a bottle of wine. 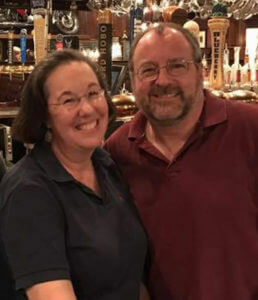 The food was excellent, as was the service and overall ambiance. On our second day we stopped for a Mexican lunch at the Naked Taco. The restaurant was pretty quiet for lunch, but appears to be quite the party location in the evenings. The carne asada burrito and chicken enchiladas were solid and reasonably priced for the area. On our final evening, we strolled down to the south point of the island for casual seafood at the Lobster Shack. We both went for the lobster roll, which was tremendous. Eating our meal outside at a sidewalk table was as pleasant as the meal itself. Oh, and the aforementioned bakery, Buon Pane, along Fifth Street, has amazing chocolate croissants and fresh donuts. While we limited ourselves to a couple of morning excursions, there were dozens of other pastries at Buon Pane that were equally enticing. A stop in Little Havana is a must for any weekend in Miami. 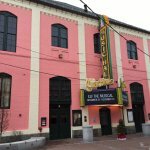 The intersection of local residents and tourists provides a fun energy, and the shopping and dining options are extensive. The little Havana experience definitely qualifies as intense. Calle Ocho provides the vibrant backbone of the area. We popped in for some mid-afternoon ice cream at Azucar. Paul had a scoop of Key Lime Pie and a Mexican Chocolate (with cayenne!) aggressively called Fry in Hell Fidel (he liked both a lot). My pistachio and vanilla almond scoops were also quite good. 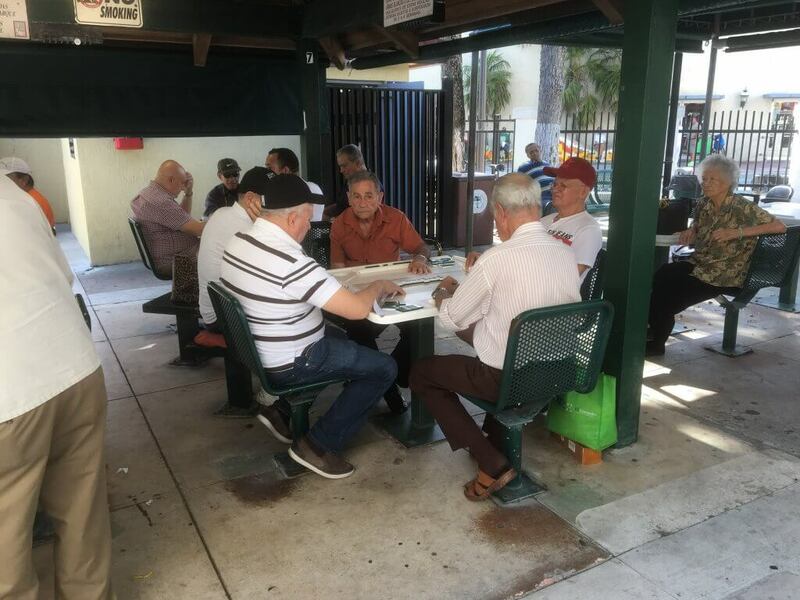 Possibly the biggest attraction in Little Havana is Domino Park (formerly Maximo Gomez Park). A group of locals, mostly older men, play very competitive dominos for hours on end. A few chess players get in the mix as well. Right off Calle Ocho, the park is worth a stop to see the action and hear the banter. On the back wall of the park is an interesting mural of Western Hemisphere leaders of state who attended the first Summit of the Americas in Miami during the Clinton Administration. 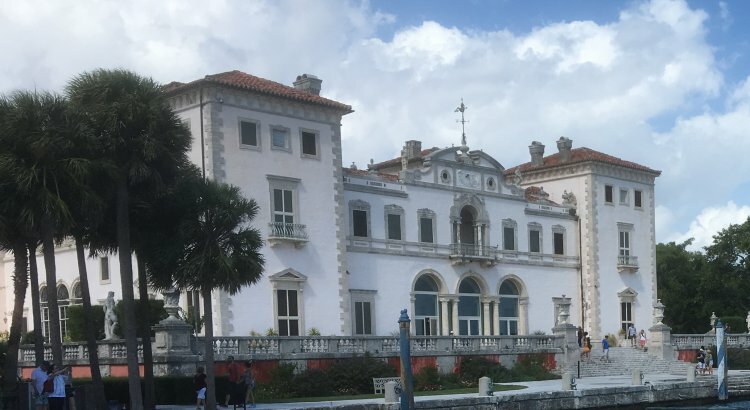 About a 15-20 minute drive from South Beach is the very unique Vizcaya Museum and Gardens. 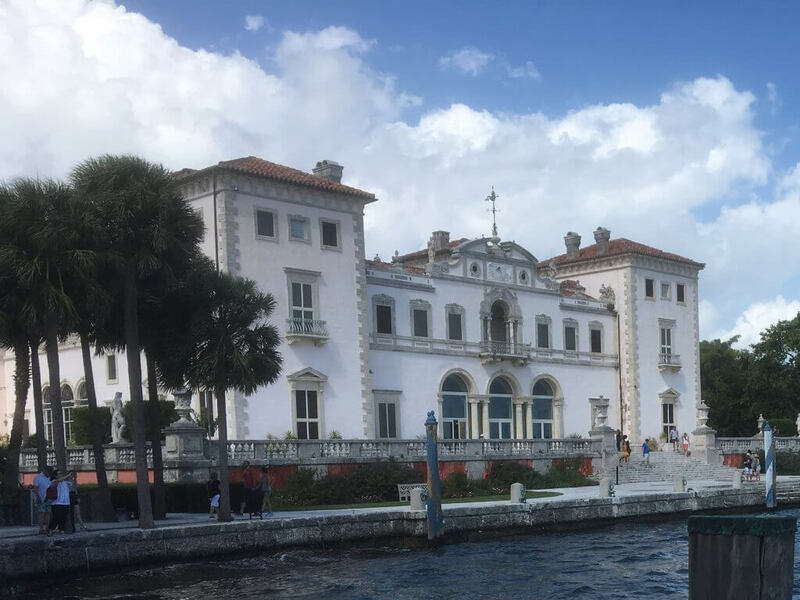 Vizcaya was built in the early 20th century as a private residence by its owner, James Deering, in collaboration with a team of architects, builders, artists and artisans. It was designed in the form of an aged Italian Villa, and it definitely has an older sense of place and history far from Miami. The house has taken a beating over the years (hurricanes, etc. ), and has gone through periods of restoration, but the current museum and grounds still provide an experience well worth a few hours of your time. There is plenty to see and read about at Vizcaya, but it is manageable in a single morning or afternoon. We started our tour inside the main house reading about the home’s development, unique furnishings, and architectural choices. The tales of the various characters involved in the building of Vizcaya, with occasional divergent visions, were quite engaging. If you go, make sure to seek out the various hidden rooms on the top floor and poke into every small space you can. 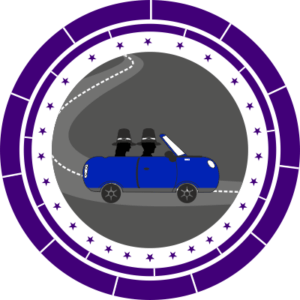 The attention to detail in constructing the home rewards the attentive visitor. After the busy interior, a relaxing stroll through the grounds bayside and then through the garden was almost meditative. The Tea House pier area is a nice spot to grab a seat on the stone wall and enjoy a look out over the bay. The winding walk through the various small gardens near the water gives you a good look at the mangrove tangle. The larger Center Island and Garden Mound give you a sense of the European grandeur that Deering was shooting for. 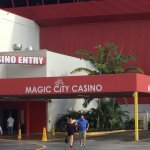 Due to our busy poker tournament schedule at local spots like Magic City, we did not end up with as much sightseeing time in Miami as we hoped. We considered an Everglades excursion, but passed due to the heat and sheer laziness. We did take a brief trip through the Miami Design District and went to see the murals at Wynwood Walls. The Design District will speak both to the Rodeo Drive high-end shopping lovers and those who like sleek, modern design elements. Wynwood Walls is a spectacular (and free!) display of urban graffiti art and well worth a trip to the Wynwood area. Frankly, despite some nice moments and lovely sights, this weekend in Miami was not our cup of tea. The congestion and high speed intensity was more than we bargained for. We were seeking a more relaxing weekend paired with winter warmth. We much preferred our more laid back North Florida sojourn to Atlantic Beach last year. That said, Miami is a haven for those who seek both natural beauty and an active social scene. Having said that, we did find joy in sauntering around South Beach and the Vizcaya Museum. And the dining options are infinitely diverse, offering amazing quality at both the low and high ends of the price range. While our intense weekend in Miami will not unseat New Orleans, Toronto, or other spots from out top 5 “must return” cities, we’re glad we got to experience Miami’s culture and warmth.